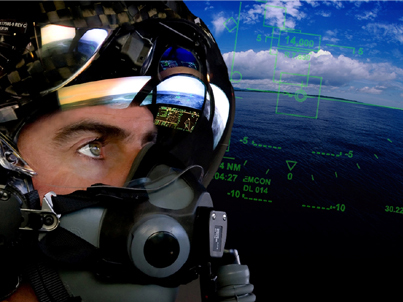 The F-35 Helmet Mounted Display (HMD), supplied by RCEVS ‒ a joint venture between Elbit Systems and Rockwell Collins ‒ provides critical flight information to the pilot throughout the entire mission. In addition to standard HMD capabilities, such as the extreme off-axis targeting and cueing offered on the legacy JHMCS and the DASH systems, this system fully utilizes the advanced avionics architecture of the F-35. The F-35 HMD delivers video imagery in day or night conditions, combined with precision symbology, to give the pilot unprecedented situational awareness and tactical capability. The F-35 HMD, by virtue of its precise head- tracking capability and low-latency graphics processing, also provides the pilot with a virtual Head-Up Display (HUD). As a result, the F-35 is the first tactical fighter jet in 50 years to fly without a HUD.